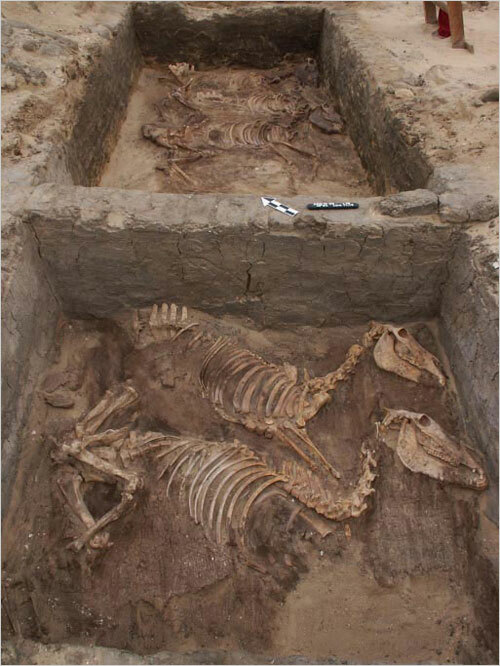 At a funerary complex in Abydos, archaeologists have uncovered the skeletons of 10 donkeys buried with full honors. The bones date from 3000 B.C. Eat your heart out, cats! The asses beat you to it. This entry was posted on Tuesday, March 25th, 2008 at 11:10 PM	and is filed under Ancient. You can follow any responses to this entry through the RSS 2.0 feed. You can skip to the end and leave a response. Pinging is currently not allowed. This discovery proves what I always knew in my heart: donkeys rule! Thank you for this exciting and welcome post. Donkeys do indeed rule. As do the pictures on your blog. Donkeys are very special animals and unfortuantely have been the subject of so many jokes. Thye are so loving and intelligent. This proves that they had great worth and value in ancient times.